Hey friends! 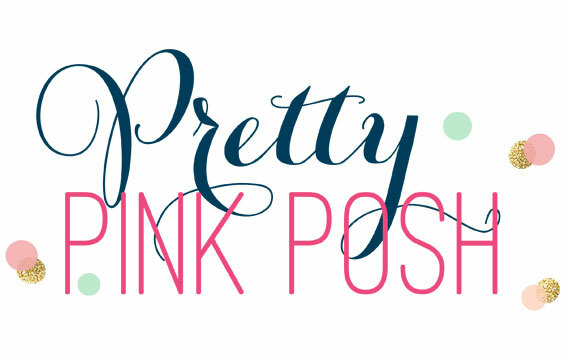 Each month, MFT showcases a fun little themed post called Hits and Highlights. Today's theme is all about summer. MFT has so many fun products that are all about summer. The cloud stencil....the palm trees...the flamingos....the list goes on! 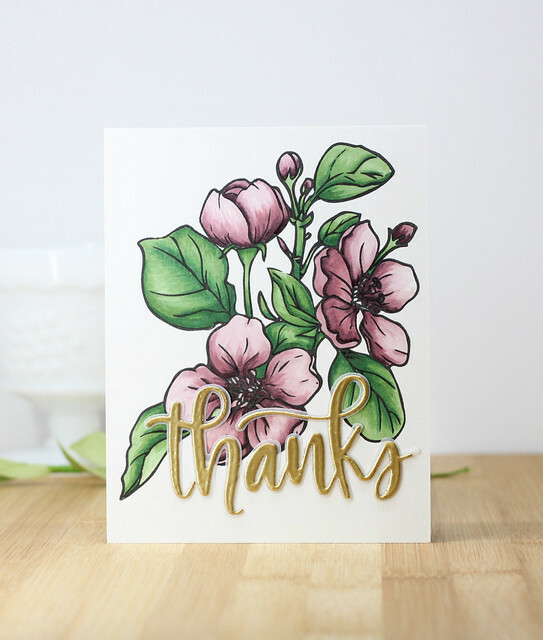 To create this card, I did a little cloud stenciling in the background and then added a little stand drift along the bottom. 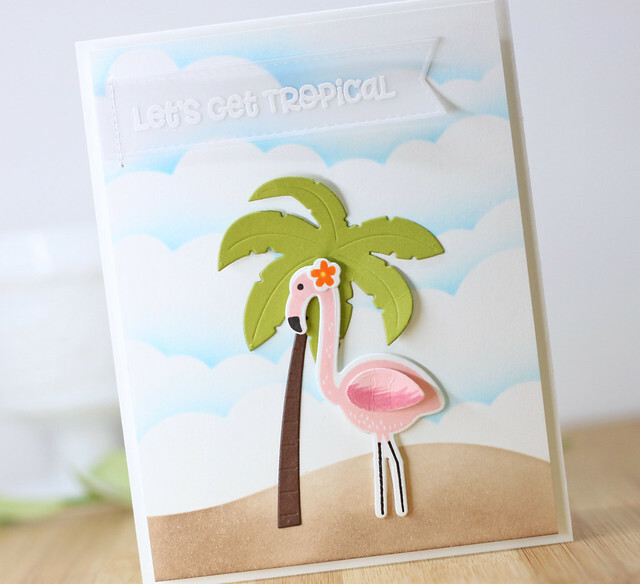 I die cut the cutest palm tree ever and then stamped the flamingo and added them to the front of the card. Last, I gave the flamingo a little orange flower for a fun little pop of color! 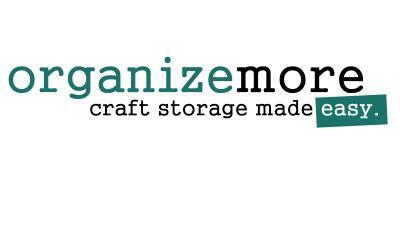 Head on over to the MFT Blog to see what the rest of the Design Team created for today. Hope you are having a great summer! When I saw this stamp set called Friendly Bunch from The Stamp Market....I had to have it. Now if you know me, you know I don't color a lot. But for this image, I had to jump in! 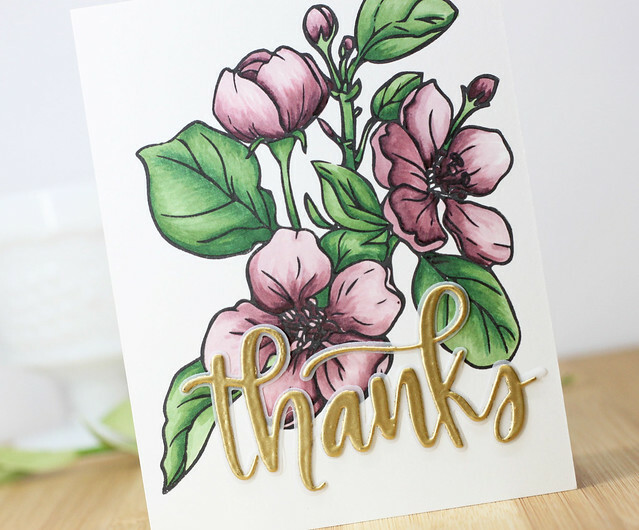 These petals were so much fun and having Lori Craig (the Copic master herself) was a huge help! I learned lots about shading and blending and I just colored away. It took me longer than Id like....my typical CAS card takes minutes, but I think this was worth it! To create the sentiment, I added Versamrk to a white die cut and then heat embossed it with Gold Embossing powder....twice. I love how the layers of powder make the sentiment pop. 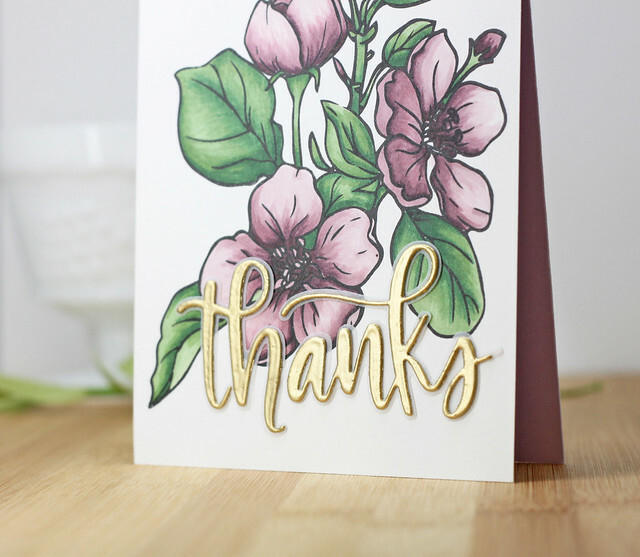 I added the vellum die behind the thanks die and added it to the card front. To finish off the card, I added the card front to a lavender card base. 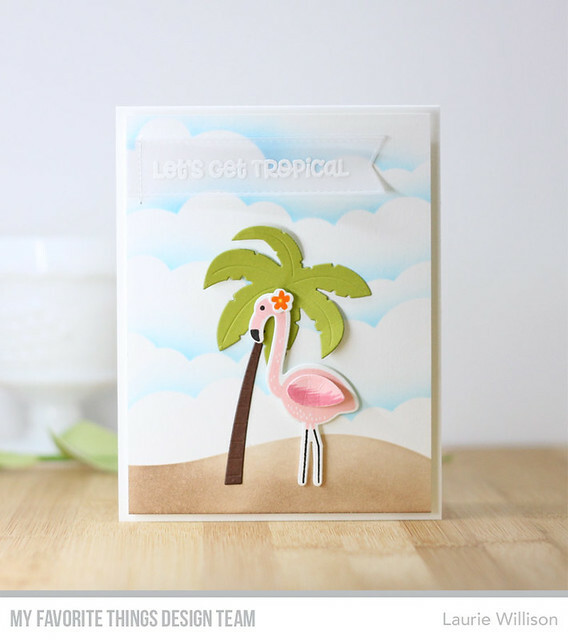 Hey crafty friends, I'm here with a couple new cards using the Summer Shakers! 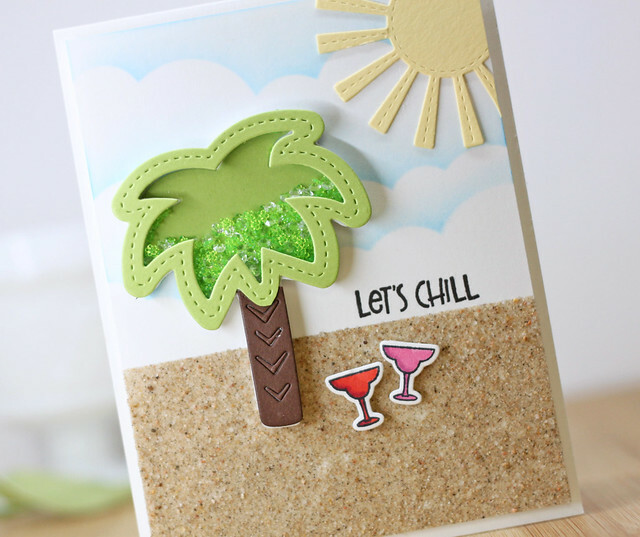 This first card was created using that adorable Palm Tree shaker box and....real sand! I lined the bottom of the card with Scor-Tape and then dunked it right in a tub of sandbox sand. I did this a long long time ago for a card and I knew I had to try it again for this summer scene. 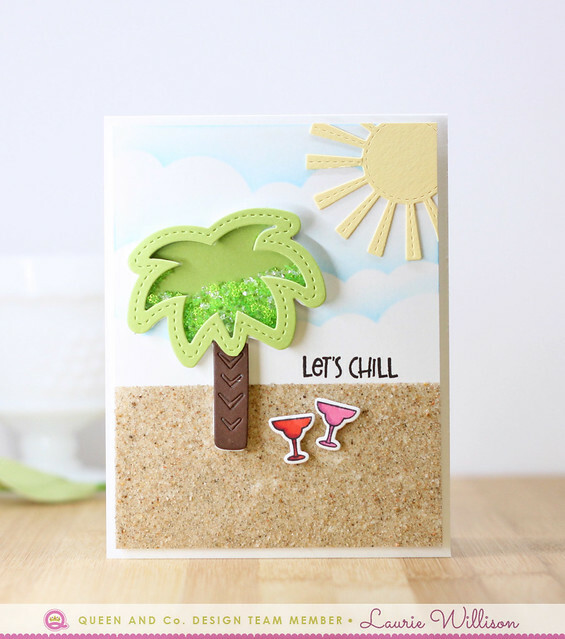 I added in some clouds in the background, the palm tree shaker box, a little sunshine die, of course, some cool summer drinks and a sentiment. 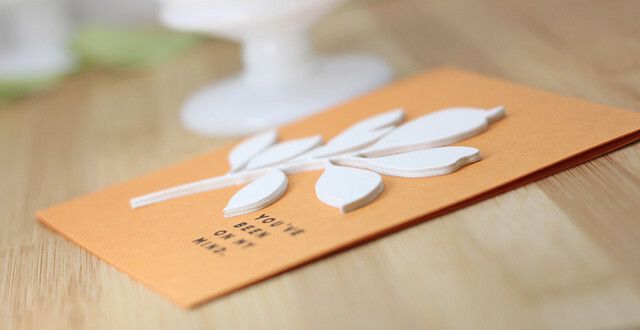 The sentiment comes in the Summer Shaker kit and is perfect for your summer cards. First, I added in a very light landscape of sand with a brown ink and then added in some light clouds to ground the flip flops. I die cut them next and added them to the card front using some foam tape for dimension. Last, I heat embossed the sentiment on a vellum banner and did a little sewing along the top. I added the card front to a Coral card base to finish if off. These flip flops? Aren't they just adorable!? So that is it for me today. I hope you are having a great day! Thanks so much for stopping in! 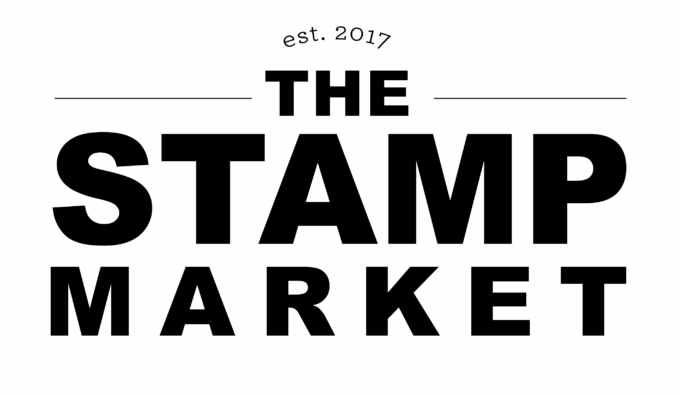 So there is this company called The Stamp Market and they have quickly become a favorite of mine. Now if I only had a money tree to buy all the things...lol! Their designs make my clean and simple loving heart go pitter patter. For real. 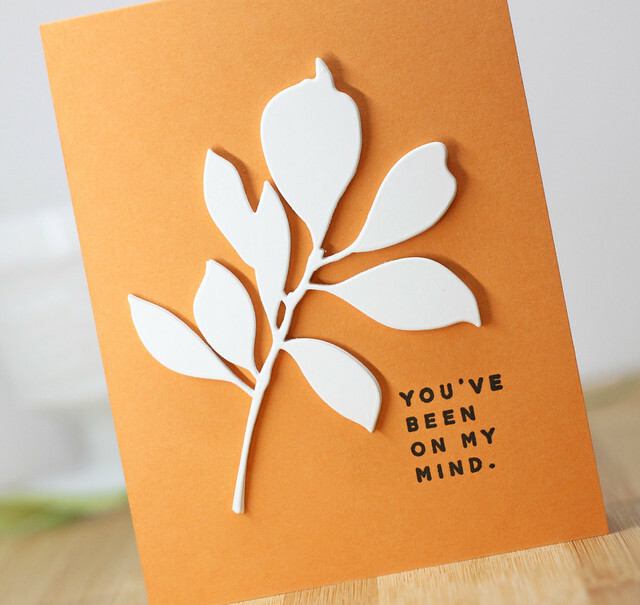 Here is a quick and simple card using the Stemmed Leaves Die..
To create this card, I die cut 6 of the leaf dies and stacked them up, adhering them with Tombow Mono Liquid Glue. 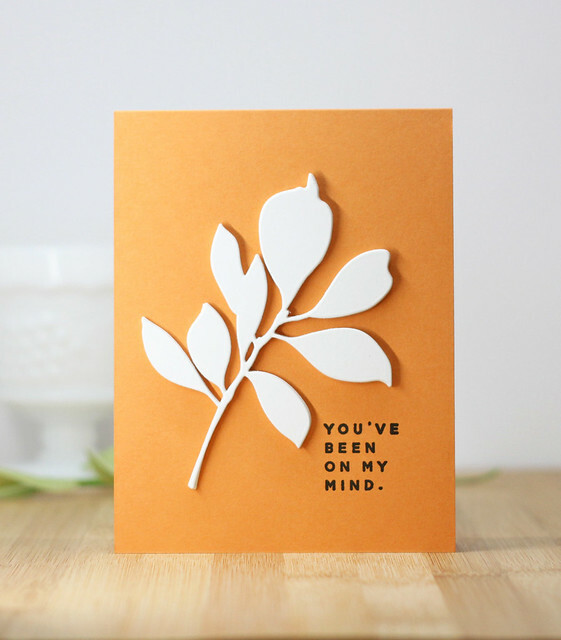 I attached the leaf stack to the front of the card and then tucked in this beautifully simple sentiment in black ink. I hope you have enjoyed today's card. So glad you stopped by! Today is kit release day over at MFT. The July kit is ready to purchase now! Head on over there to grab one up before they are gone. 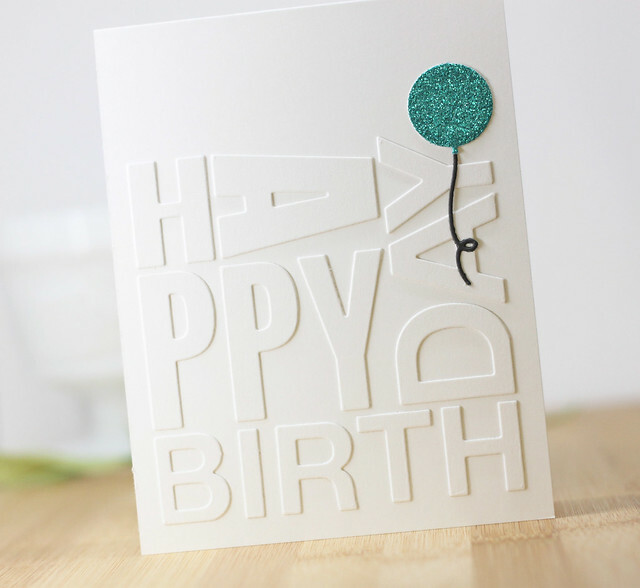 Here is one last card to share....an easy one layer card! To create this card, I used the new Grass Stencil along the bottom edge, blending 2 Oxide inks to create that beautiful green grass. Next, I stamped the cluster of balloons and their tales along the top. Last, I used my Misti to add in the sentiment. Check out the new kit by clicking HERE. 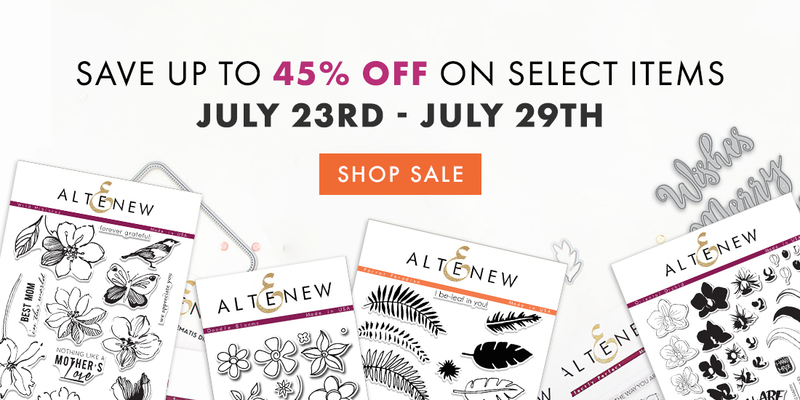 Enjoy the great deals up to 45% off on selected items in the Sale collection from 7/23 through 7/29. 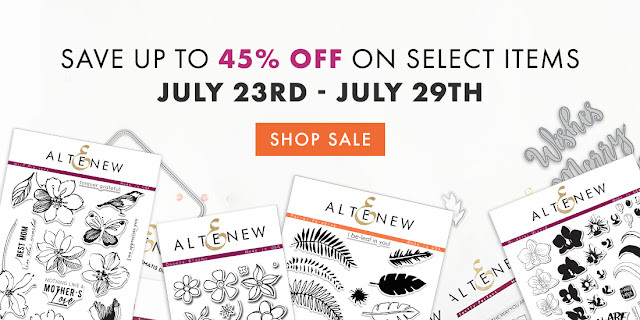 Shop here → SALE! All products in today's post are linked above and throughout the post. These are my personal affiliate links which you can shop from at no cost to you! :) Thank you for supporting Soapbox Creations! 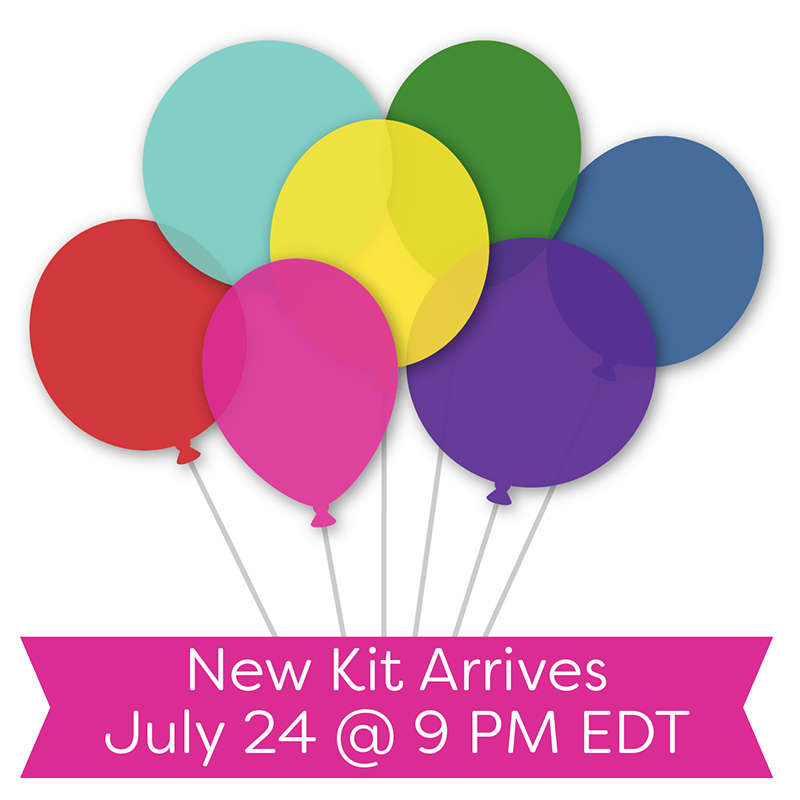 It's already time for another kit countdown over at My Favorite Things. 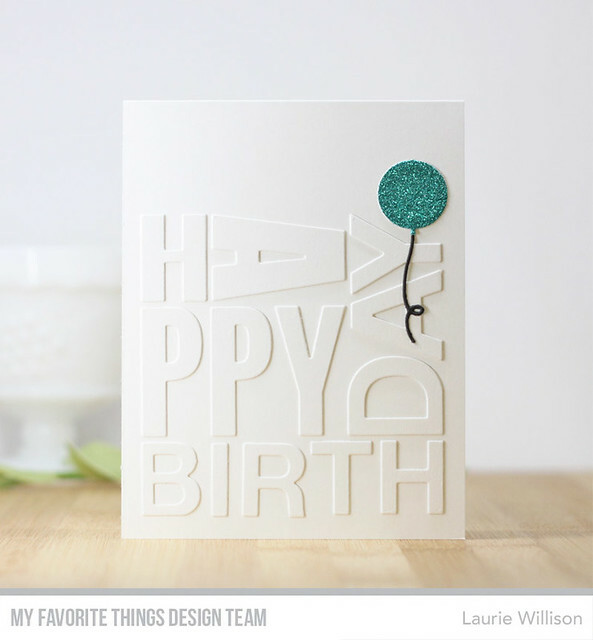 Every month, MFT releases a kit including a variety of card stock, a stamp set and a coordinating die set. 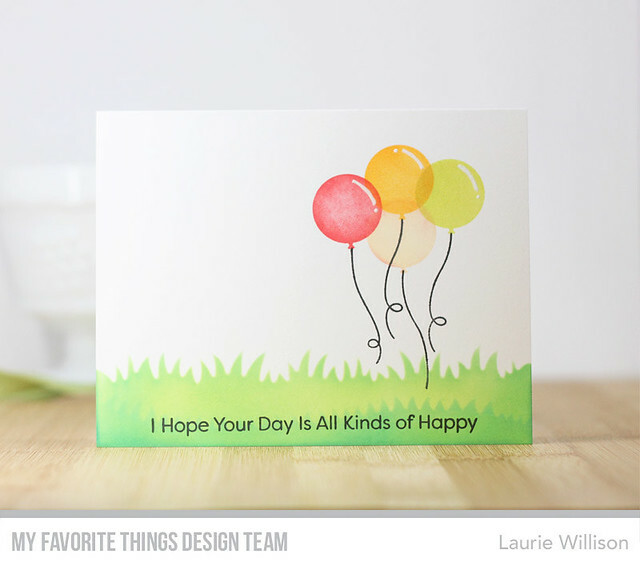 This months kit is called Bundle of Balloons and its adorable! 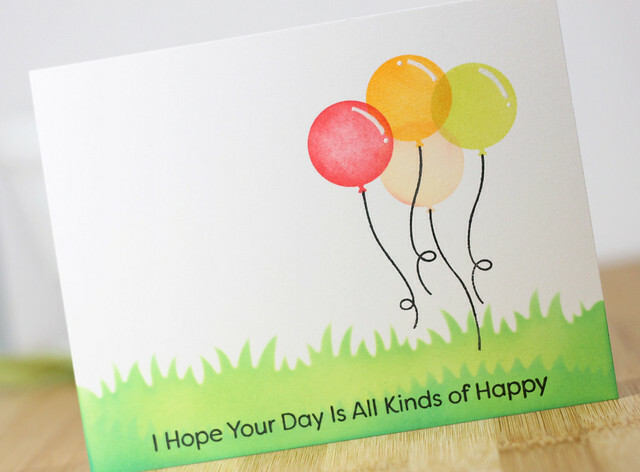 To create this card, I masked off the knot on the ballon and filled the card front full of colorful circles. Next, I die cut the Happy Birthday Candles right into the card front. I popped the whole panel up on foam tape and then added in the sentiment, along with a tiny ribbon of vellum, right onto the candles. I left the area behind the candles white so they could stand out from the colorful card. The rest of the Design Team will have lots more to see so check out the MFT Blog. We have 2 more days of countdown so check back to see more. You'll be able to shop and grab up your kit on Tuesday! Thanks for stopping in today. Hope you have a great day! Hello there friends! 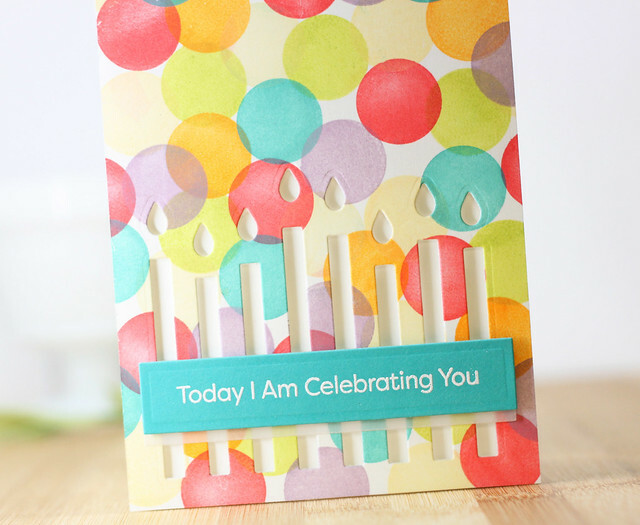 I am stopping in today with a new card using the MOST adorable set from Spellbinders. 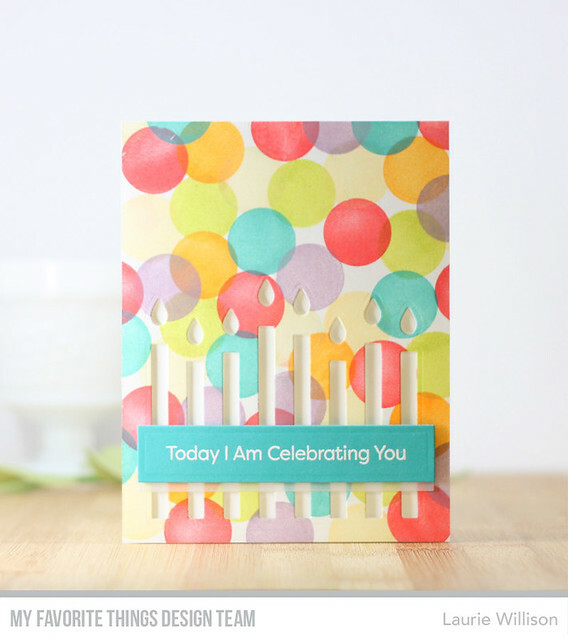 This set included a large sentiment that is so perfect for all card makers! We put our hearts into each creation, don't we? 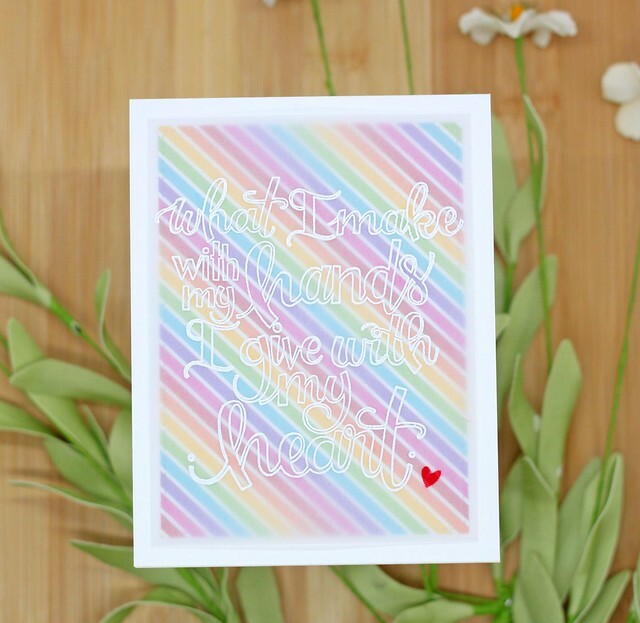 To create this card, I took a white card base and layered a rainbow stitched rectangle directly to the card base. Next, I heat embossed this gorgeous sentiment on a piece of vellum. I wanted the rainbow to show, but I wanted the sentiment to stand out and not get lost. 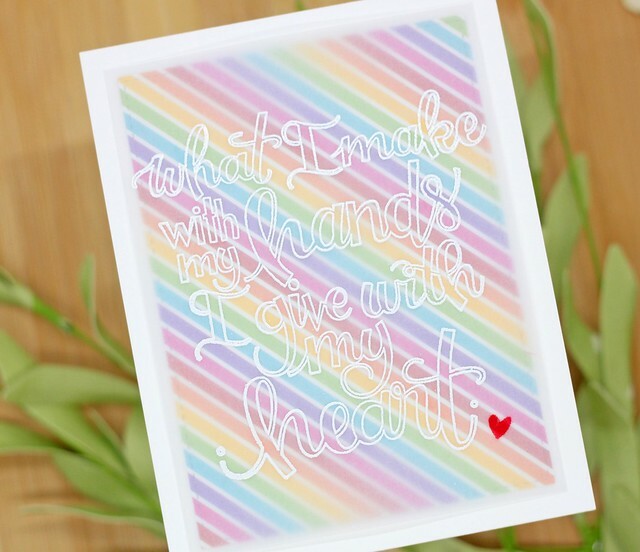 I love how the vellum muted the rainbow enough to really show the sentiment. Last, I stamped a tiny heart and used Red embossing powder to make the heart shine! 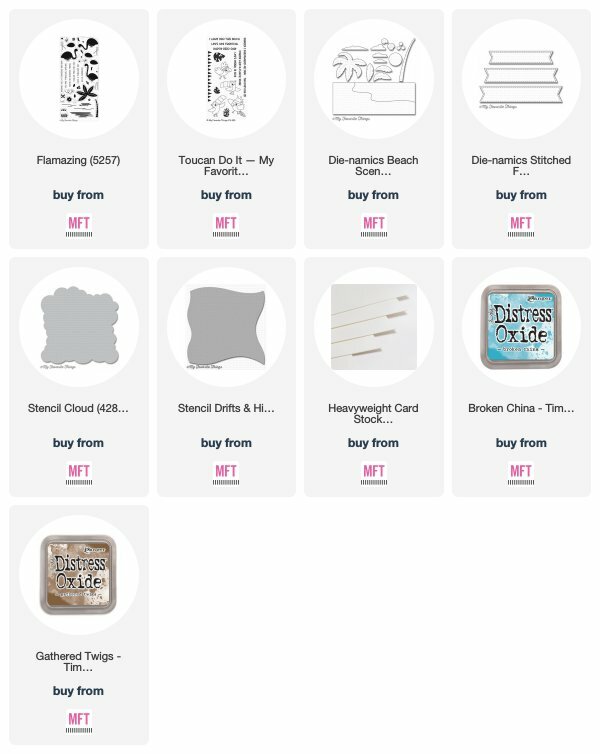 Check out all of the stamp and dies sets by Tammy Tutterow over in the Spellbinders shop by clicking HERE. 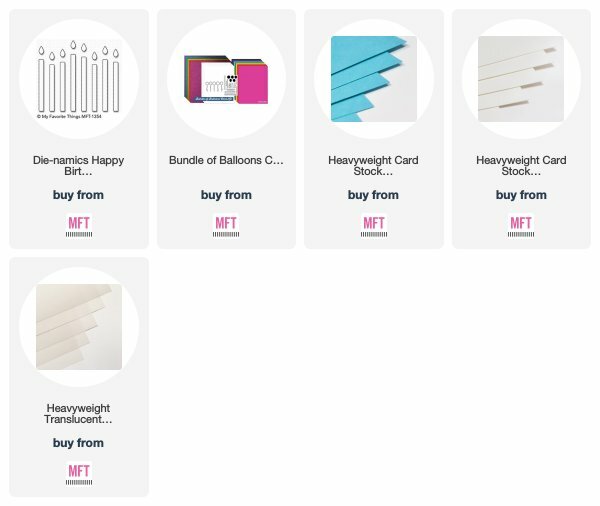 All the products used in todays card are linked below. I am so glad you stopped in today. Hope you have a great day!